My Life as a (Rookie) Editor: New Books! With all the craziness happening in my life as of late, I forgot to mention that I found three new books with my name on them! Yaaaay! So if you’d like to indirectly support me, or at least let Tokyopop know that the stuff I work on is awesome, please buy these books! 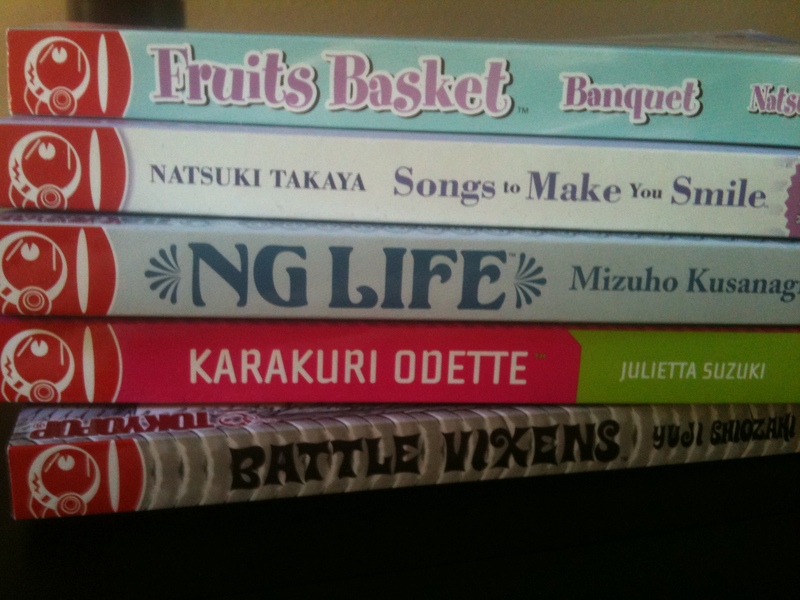 This entry was posted in manga and tagged books, Julietta Suzuki, Karakuri Odette, Life of Editor, Mizuho Kusanagi, Natsuki Takaya, NG Life, publishing, Songs to Make You Smile, tokyopop. Bookmark the permalink. 16 Responses to My Life as a (Rookie) Editor: New Books! Is “Songs to Make You Smile” is a short story anthology? Thats my favorite type of manga. You know what be cool? If you buy the books and then take a picture of where your name is in them. haha That be fun to see. I actually have the books and have a picture of them, but due to some computer troubles, I can’t do that yet. I’ll update the post when I can. That’s an awesome feeling! I got to do that with my friend Annaliese, who works for Viz, when I found out she’d worked on Solanin and it’d gotten an Eisner nom. That was an excellent feeling. I’m keeping up with Karakuri Odette, and I wanted to check out Songs too… so I’ll be sure to watch for your name in the credits! 😀 Congrats!! 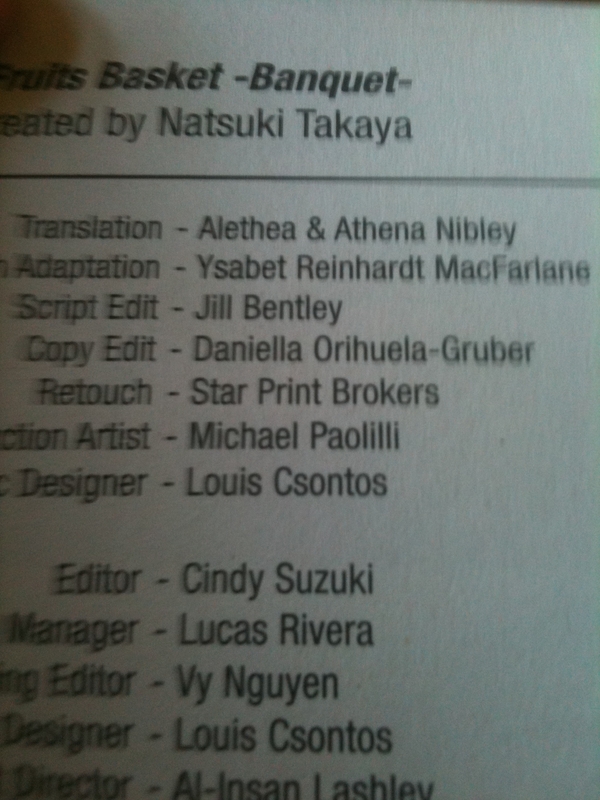 Also, man, I knew Ysabet and the Nibley Twins worked on Banquet, but it’s awesome seeing all their names and yours together on that page. I agree with Kris, it’s super exciting to spot names of people I know in my manga. What a great team!! Why thank you! It was super-exciting to work on that project even though it was rather hellacious. (You’ll see what I mean when you get it. Hooboy.) Everyone put a lot of work into the book too, you could tell. Most of my problems were about fonts and whatnot, not the actual translation or adaption! Nice. I’ll definitely pick up the Natsuki Takaya title. Yaaaay! 😀 I would recommend picking up the other two as well. I like both series a fair amount, but they ARE shojo, so that’s up to you. Hey, Fruits Basket will always be my first real anime love, so I have nothing against shojo. Oh ok! I did not know! 😀 I am all for boys enjoying some shojo-y goodness and vice-versa.